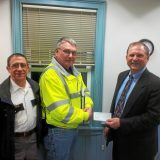 GRANVILLE, MA — The Berkshire Trail Riders Association (BTRA) is pleased to announce that Granville Fire Department has been awarded a grant in the sum of one thousand dollars, following their request and application to the BTRA Emergency Services Grant Program. That program was formally established by BTRA with assistance from senior club member, Vince Lee of Lenox, MA. For years, the club has given back to the local community by way of donations, but Lee wanted a vehicle that would streamline the process, and get help to those most in need. As a local resident suffering a terminal illness, and an active member in other charities, Lee clearly understands the dichotomy between community volunteers and under-funded programs. Michael Sullivan, Chief of Tolland Volunteer Fire Department was invited to participate last year, was awarded a grant, and was able to obtain a rescue sled which can be towed by an ATV or snowmobile to an accident site in the woodlands of Tolland or other towns in the area. This year, Sullivan’s grant application was awarded again, and he plans to outfit the rescue crew with communications and head protection for back-country egress. The Berkshire Trail Riders Association, Inc., has given generously to both local and national charity organizations alike, including local fire departments and EMT units, police departments, State Forest and DEP agencies, both private and public land owners, and The Ronald McDonald House Charities, an organization dedicated to creating, finding and supporting programs that directly improve the health and well being of nearly 4 million children worldwide every year. 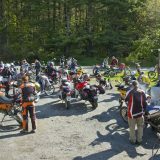 Founded in the early 70’s as the Foothill Trail Riders and later incorporated in 1992, the Berkshire Trail Riders Association has been advocating responsible off-road motorcycle riding, competition, and local philanthropy in the greater New England region for nearly fifty years. The group treasures the trails they ride, actively promoting their preservation through ongoing trail maintenance, while working alongside various local, state, and federal agencies. 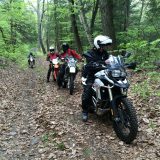 Berkshire Trail Riders Association, Inc.